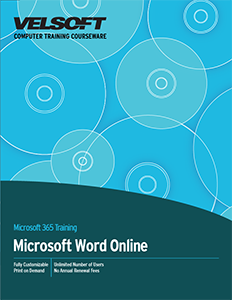 Seeing is Believing This sample manual to teach Microsoft Word Online is in MS Word format. Microsoft Microsoft Word Online 2016 is an instant messaging platform that includes voice calling, video conferencing, and a variety of collaboration features. This course is intended to help learners use Microsoft Word Online 2016 to communicate with their colleagues in different ways. By the end of this course, learners should feel ready to use Microsoft Word Online 2016 to send instant messages and participate in audio and video calls. Also, they should be able to customize Microsoft Word Online to suit their needs. For more information, download a free sample now.